A protoype of Canada's Juno rover stretching its legs here on Earth. The Canadian Space Agency is in early talks to launch a rover beyond Earth orbit aboard NASA's huge new deep space rocket, according to a senior Canadian official. Canada recently unveiled seven rover prototypes that cost a total of $60 million. Some of the rovers have been field-tested with NASA and impressed officials with the U.S. space agency, according to the CSA's Gilles Leclerc. As such, Leclerc said NASA is considering flying a rover on an early flight of its Space Launch System (SLS) rocket, which is slated to become operational in the early 2020s. However, he allowed the discussions are preliminary given the upcoming U.S. presidential election and uncertainty about future NASA funding. The SLS has two publicly disclosed missions on the roster: a flight in 2017 to send an uncrewed Orion spacecraft into lunar orbit, and another potential flight in 2021 to take a crew beyond the moon. Any SLS flight beyond those two missions will require further study. "NASA does not have plans for either (mission) to land on a foreign surface," NASA spokeswoman Rachel Kraft told SPACE.com via email. "As we continue to define future mission requirements, NASA anticipates that we will continue to engage in co-operative activities with CSA involving Canadian rovers and associated technologies," Kraft wrote in a follow-up statement. The CSA is facing a 20 percent budget cut — to $310 million, or USD315 million — in the coming year, as well as overall uncertainty about government spending priorities. Canada is currently undertaking a review of government aerospace programs, with a report expected to be submitted to the government late in 2012. Money for the rovers came from about $110 million in stimulus funding the CSA received in 2009. (The other portion of the stimulus money went to Canadarm prototypes.) The initial plan for the rovers was to develop technologies for the floundering auto sector in Canada during the recession, Leclerc said. But now that the stimulus funding is spent, there's not much more money coming to upgrade the rovers to flight status. The agency has about $2 million available every year for rover work, Leclerc added. "We will see what the government does with the aerospace and space review, and how high space ranks as a priority," he said. "Somewhere in the future we can develop a rover (for flight), or at least provide signature technologies in robotics and vision systems. That's our Canadian heritage." A prototype version of the Canadian Space Agency's proposed Artemis rover. More than 40 institutions received funding for rover development, including name-brand Canadian space companies such as sensor manufacturer Neptec and Canadarm maintainer MacDonald, Dettwiler and Associates. Leclerc said that some companies have already been able to find new applications for the rover technology. Montreal-based Bombardier, for example, transferred some of its rover technologies into a new, self-commanded electric version of an all-terrain vehicle, according to Leclerc. Additionally, Hydrogenics — which manufactures fuel cells — received a $90 million contract in early October. The contract, from an undisclosed buyer, purchases technology similar to the kind Hydrogenics used for the rovers, Leclerc said. Hydrogenics touts the deal as its largest single order from an original equipment manufacturer. Neptec Design Group was prime contractor for two of the rovers, called Juno and Artemis, which have been field-tested several times with NASA. 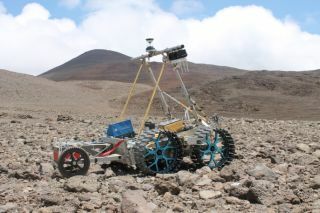 Company president Iain Christie said he was grateful for the funding the CSA provided to develop the rovers and a rover vision system, but added he cannot continue to work on them without more money. Certainty needs to come from the CSA and the government as a whole regarding Canada's space priorities, he added. Christie said he remains hopeful that one of his rovers could take flight on the SLS, though. "We don’t have the resources to do a lot of work on our own without knowing what the end point is going to be," he said. "If Canada is not going to be interested in participating in an international mission on the moon, there is no point to us having a Canadian rover."